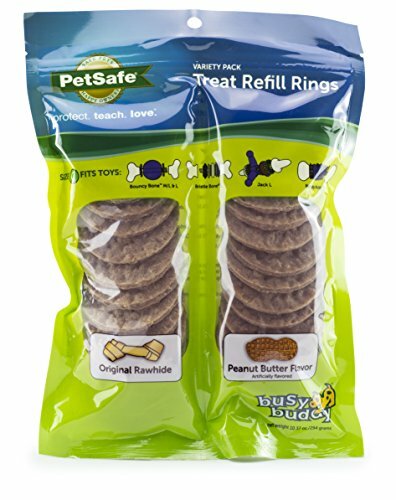 Excite and entertain your dog with delicious treats from the PetSafe Busy Buddy Variety Pack Treat Refill Rings. These yummy refill rings work with many Busy Buddy Treat Holding Toys to provide your pet with a boredom-busting play experience! Available in three sizes, the Variety Pack Treat Refill Rings offer variety along with value. Each resealable bag contains 12 Original Rawhide and 12 Peanut Butter Flavor treat rings. Alternate between flavors or combine them to delight your dog.